for $339,900 with 4 bedrooms and 3 full baths, 1 half bath. Now available in the well known community and golf course of Chickasaw Point. 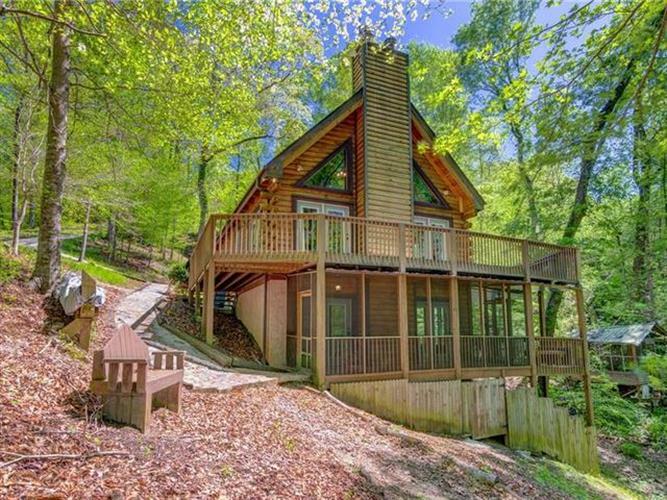 This spacious log home offers the look and feel of being in a rustic mountain lodge while located on the beautiful waterfront of Lake Hartwell. The home is situated on a double lot, nearly an acre of privacy and 160' feet of lake frontage. With 4 bedrooms, 3 and 1.2 baths, this home has plenty of room for friends and family to enjoy all year. Inside you'll find everything you want in a dream lake home, such as a huge great room with white pine ceilings, wall of window views, multiple fireplaces, hardwood floors, 2 main floor bedrooms, master bedroom with master bath in huge loft, entertainment area on terrace level, storage area/workshop and over 1000 square feet plus two stories of decks with under decking installed for a dry outdoor eating area along with a screened-in porch area. Excellent vacation rental history. Seller has upgraded the driveway and has plans in hand for a garage if so desired. There is a full covered slip dock in place with solar power, 10' swim platform and boat lift boat lift. Enjoy swimming right off your dock Chickasaw Point offers a beautiful 18 hole course, pool, dining and much more. Make an appointment today to view this home.